You can never have enough bass trapping for small non-diffuse rooms. 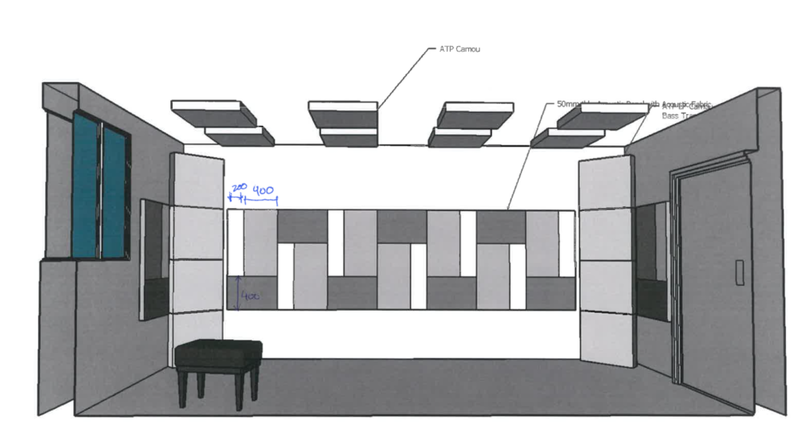 A piano room is only as good as how you build it. A balanced room should allow the piano to sing fully under the fingers of pianist. Small rooms inadvertently prevent this from happening. Common advice is to size your piano according to your room as bigger pianos can play louder and deeper causing havoc in small rooms. What many people probably never realize is that loudness is but only one aspect of the problems of untreated piano rooms. Echoes and reflections of untreated rooms tend to muddle the playing of staccato/legato notes and prevent the player from full expressiveness in playing. For this project, we were given the task of fitting a grand piano into a small cosy room with dimensions of 2.5 metres x 6.0 metres. As the piano room shared a party wall with the master bedroom, there was big concern about noise disturbance from the piano practice. Another concern is whether the piano would become too loud forcing the pianist to play in perpetual pianissimo. 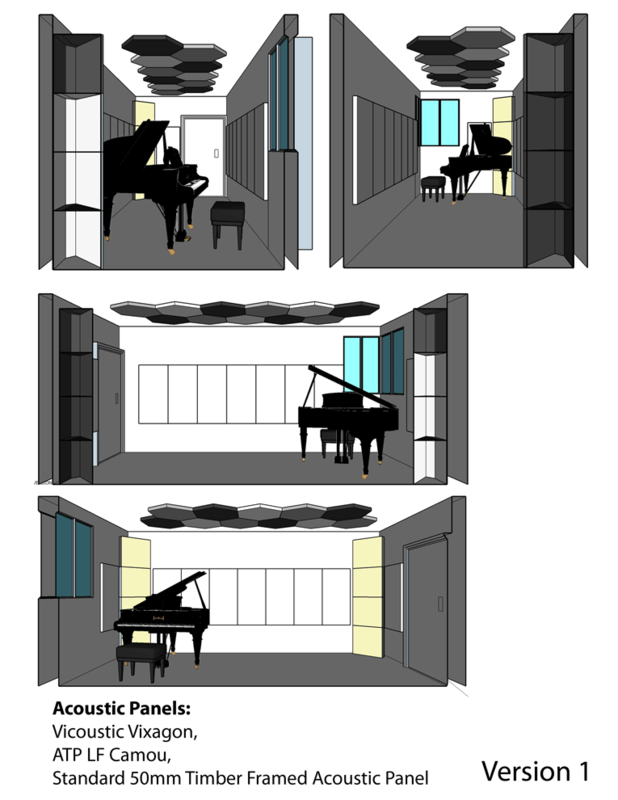 Final Layout of the acoustic panels in the room; Right Wall Shown. After investigation, we found that there were 3 main paths of noise propagation from the piano room to the adjacent bedroom. The first path was directly transmitting through the wall. 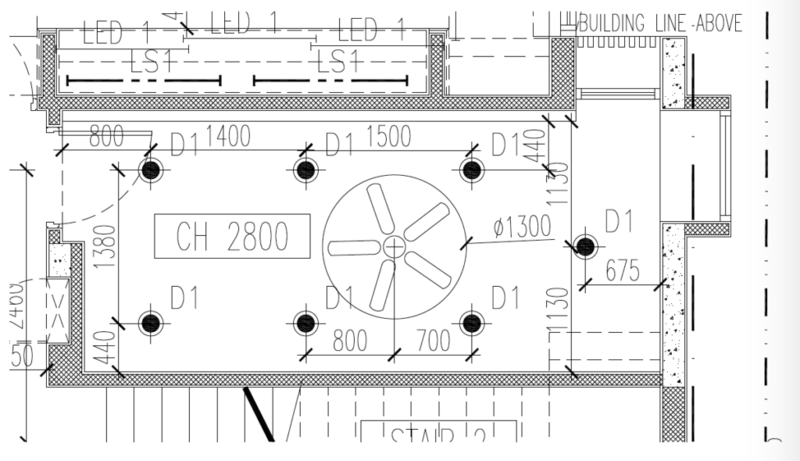 The second path was via the windows that were shared between the 2 spaces. The third path was via the doors of the master bedroom and piano room which were adjacent to each other. We recommended the replacement of the existing glass in the windows with laminated glass. The windows were already of the casement variety so sound leakage due to gaps was not a huge concern. 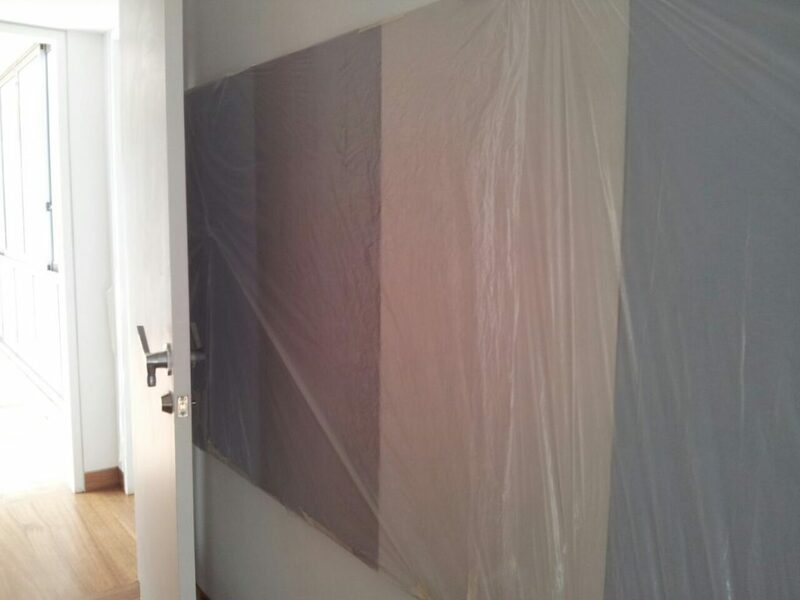 For the walls, we built an floated partition construction with Vicoustic isolators to minimize airborne sound leakage. We also installed acoustic doors for both the master and guest bedrooms. Acoustic Treatment-wise, the instructor wanted something that was more absorptive in order to mimic the conditions of practice of the absorbent sounding studios found throughout Singapore so as to make more mistakes more prominent. 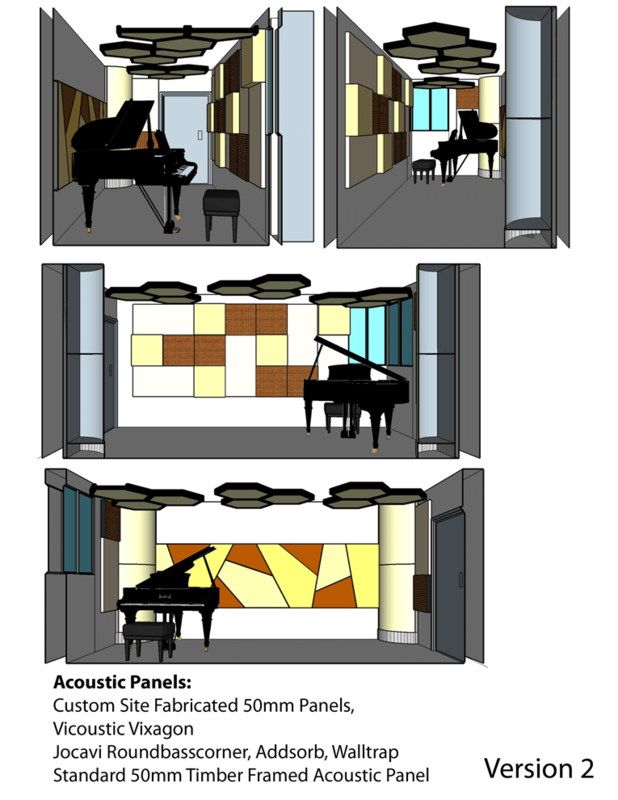 3 Designs were provided to the client (shown above) that had varying levels of bass performance. 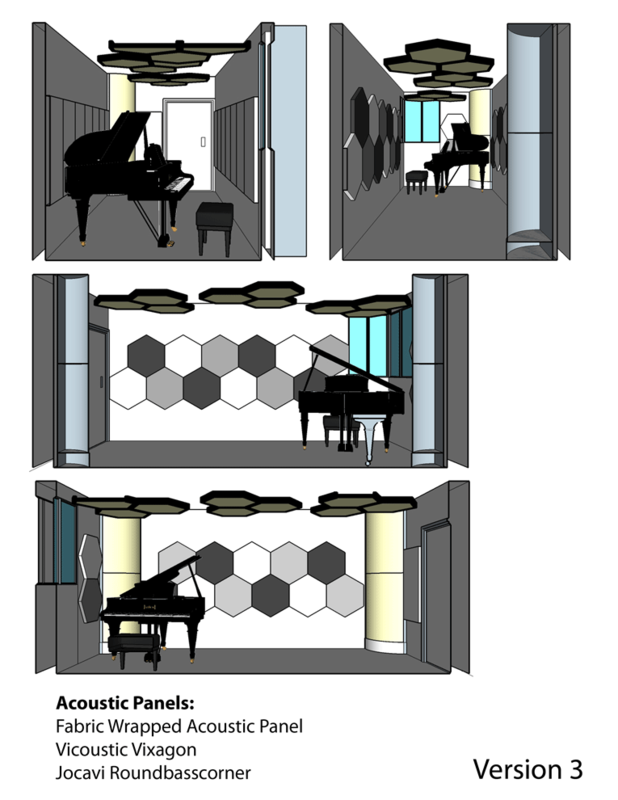 Version 1 with some modifications was eventually chosen as the final acoustic design.